You can install windows XP from USB flash drive in the similar way as Vista and Windows 7. But generally it is not easy to make a bootable USB flash drive for XP. At first download the softwareWin to Flash . It does not need the installation. After running the setup file the following screen will appear. From Task tab you can choose your task. After choosing task press next . 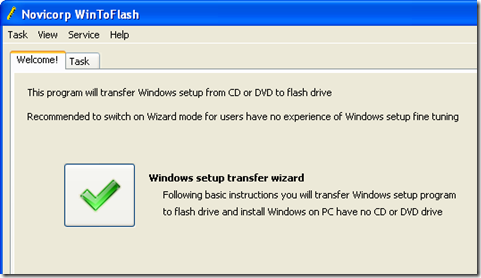 Select the source path of the windows installation disk or copy and then the path of your USB flash drive. Now the exact bootable copy will be made in the USB Flash drive. You can now install Windows XP from Flash drive. 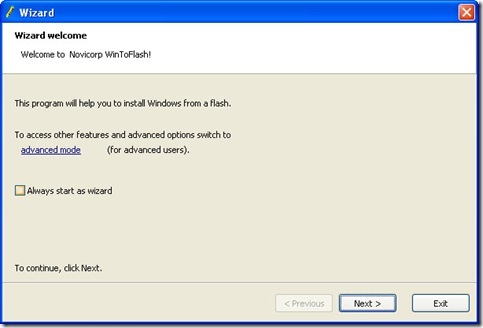 It is pretty easy method to install Windows XP from your Usb flash drive. If any problem arises then contact us. You can also manually build your USB flash drive enabled for installing XP in it. Any question or suggestion is always welcome.